Spokane attorneys have filed a second federal lawsuit on behalf of landowners affected by water contamination near Fairchild Air Force Base. The first suit, a class action filed in April in U.S. District Court, targets manufacturers of the toxic firefighting foam that seeped into the water table from training sites on the air base. The suit represents more than 100 people and cites an array of health problems purportedly caused by the water contamination, as well as diminished property values. The new complaint, filed in the same court last week, alleges Fairchild officials used the fire retardant recklessly and failed to warn neighbors of its “inherently dangerous properties.” The complaint was made on behalf of two landowners and seeks damages from the federal government. Fairchild officials first acknowledged in early 2017 that groundwater in the area had been contaminated by aqueous film-forming foam, a widely used fire retardant that contains toxic perfluorinated chemicals. 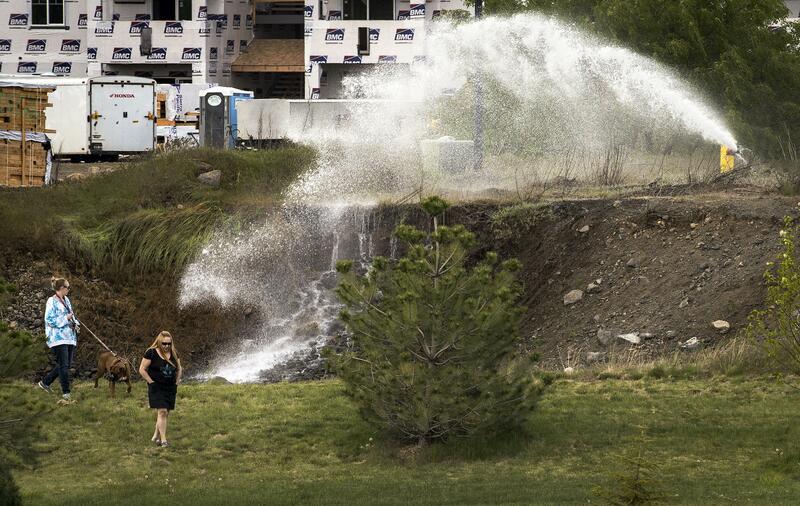 The contamination later forced Airway Heights to flush millions of gallons from its drinking water system; the city now pipes in water from Spokane. Those same chemicals have also been used in nonstick products such as Teflon and Scotchguard, though they have been phased out of use in consumer products since the early 2000s. The chemicals accumulate in the environment and in the bloodstream much faster than they degrade and have been linked to an array of health defects. Vincent Fiattarone is one of the plaintiffs in the new lawsuit against the federal government. According to the complaint, he signed a contract in October 2016 to lease 5 acres of vacant land beside his home in Medical Lake. The woman leasing the land planned to dig a well, build a home and ultimately take ownership of the property, but she had second thoughts after learning of the water contamination in June 2017. Hoping to salvage the deal, Fiattarone paid that month to have a neighboring well tested for the perfluorinated compounds, but the results showed chemical concentrations “far in excess of those declared safe by the Environmental Protection Agency,” the lawsuit states. A couple of weeks later, he paid for a second test, and the results showed even higher concentrations. The woman canceled her lease in October 2017. In March of this year, Fiattarone managed to sell the land for $45,000 with the help of a real estate agent, who took a commission. That was nearly $30,000 less than the price he had negotiated with the woman before disclosures about the water contamination. Add legal fees and a loss of rental income, and the contamination cost Fiattarone at least $44,822, the lawsuit asserts. The other plaintiffs are Bradley and Jan Shrum, of Airway Heights. The complaint states that the chemicals poisoned two wells on their 17-acre property, where they have grown hay and wheat since 1982. The Air Force has installed a filtration system on the well that supplies their drinking water, but it refused to do anything about the well they use for crop irrigation, the lawsuit states. Athough the fire retardant was used at Fairchild for decades, the lawsuit blames contaminated water and soil for a massive crop failure the Shrums experienced in 2017. The complaint states that their crop yields dropped 55 percent from the previous year, and it was the first major failure they had experienced in three decades of farming. The Shrums didn’t plant a crop in 2018 because of the previous failure, because a local grain distributor feared buying contaminated crops and because a federal program would not offer insurance on crops irrigated with contaminated water, the lawsuit states. “The Shrums will not be able to plant a crop in future years, unless and until a way is found to purify the irrigation water and soil,” it states. Already, the Shrums have had to rely on other sources of income, the lawsuit states. But they still have to control weeds on the fallow land, which requires labor, diesel and herbicides. And they could be liable for back taxes because their land is designated as an “open space,” which means it must be used to generate income. The government has yet to respond to the lawsuit. Biviano, the plaintiffs’ attorney, is working on the case with colleagues Mary Dillon and Breean Beggs, who is also a Spokane city councilman. In the class action case, which is still in early procedural stages, they are receiving help from the New York City firm Napoli Shkolnik.